Agnès Varda's usual cinematic beauty and charm come through, with her subjective experience creating a wonderfully delightful film about art. 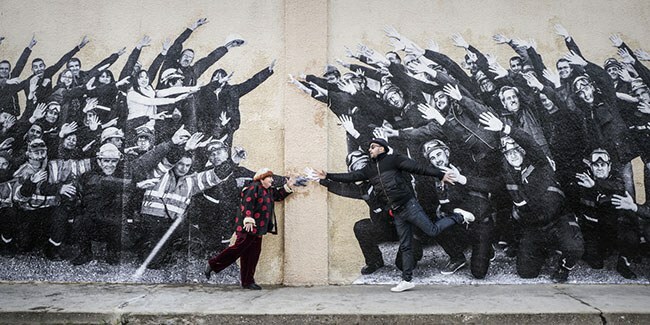 Faces Places, screened at the Toronto International Film Festival, is a film about many things: centering on a road trip to various villages taken by directors Agnès Varda and JR, the pair photograph the people they meet, with graffiti artist JR pasting massive portraits across buildings. While looking to JR’s art and the way it impacts his subjects, the film rambles across several topics as the two directors converse. They discuss art, animals, food, and friends. But significantly, much of the film verges onto the topic of representation. With vignettes in each village Varda and JR visit, it is Varda especially who wants to know how the people they photograph feel. The film features these subjects discussing their portraits, with disparate reactions. A woman in a mining town breaks down in tears, and JR gives her a hug; a farmer jokes that he doesn’t need a larger than life mural of himself to be the most important man in his area; a waitress expresses shy discomfort at her image being photographed so often. While JR takes a more personal approach to his art, for instance, making a mural of a goat for Varda in honour of her love of the animals, it is Varda herself who looks to the meaning of images and representation. Deciding to photograph the wives of dock workers, she is intent on showcasing the women who are lost in the usual glorification of men, while giving space for these men specifically to praise their wives. Bleeding from JR’s art is a concern with representation more broadly. A constant annoyance for Varda is JR’s insistence on never removing his sunglasses, and commitment to this image of himself which he has created -- something she compares to her “friend” Jean-Luc Godard. When the two visit Godard, they find his windows shuttered with iron and his door locked, with a riddle written on the door which leaves Varda in tears. JR takes off his glasses to cheer her up, and his face is blurred, as if we are seeing him through Varda’s own failing eyesight. Varda’s subjectivity as an older woman is key to Faces Places. While co-directed with JR, it is her voice which comes through the most: we are seeing through her eyes almost literally at many points in the film. And her experience is specific. She discusses age with JR, taking an interest in his 100-year old grandmother, and discussing changes in her lifestyle. We watch as she states she can no longer run, so their re-creation of the race through the Louvre from Godard’s Bande à part (1964) involves JR pushing her in a wheel-chair as she marvels at the art that speeds by, and he performs acrobatics. We watch as Varda gets a needle in her eyeball (to her, it’s nothing compared to the eye-slit in Un Chien Andalou,1928) and recreates an eye exam while discussing her changing vision. Varda’s subjectivity in her documentaries is part of what makes them so good: her musings on her life and loved ones (particularly her films about her late husband, Jacques Demy), are the perfect combination of her formal sensibilities and personal charisma. Faces Places is no different. But here her specific engagement with health and age seems significant in conversation with other films at TIFF this year. In Guillermo del Toro’s The Shape of Water, we watch as Sally Hawkins plays Eliza, a woman who cannot speak, and who expresses, unchallenged, that the only person who would love her is a fish monster. Being incomplete (her word), it is only the fish man who would care for her, while she compares herself to him in that neither of them can talk: in her disability, she aligns her self with an animal. In Naomi Kawase’s Radiance, we watch as the sighted Masatoshi Nagase plays a man losing his vision, while he manages to teach his love interest about his experience (something which is constantly undermined by his anger and aggression, which is presented as over-emotional irrationality rather than a reaction to a society which does nothing to accommodate him). In Wang Bing’s Mrs. Fang we watch as Mrs. Fang herself, dying of Alzheimer’s, is completely unable to speak for herself, and our experience of her is entirely “objective” (or voyeuristic) in the director’s hands. By contrast, Faces Places gives us Varda’s experience, through her camera, and in her own words. When she is sick, we experience it as she wants us to. When she discusses health, illness, or death, it is in her own words. We have in her film the representation of someone actually going through her lived experience, giving us a perspective which is unique, articulate, and needed. Unlike so many other films where these representations are metaphorized, exploited for drama, or mediated by someone else, this is Varda’s subjective experience in her own words. Featuring the director’s trademark charm, intriguing thematics, and padded out with a great chemistry between her and JR, Faces Places is a wonderful film overall. But it is equally a refreshing counterpoint to the number of films about health, disability, and death that lack a tangible sense of understanding.